The post relates to the ongoing narrative campaign that is being run by my gaming group. All the missions used for the first phase use fixed forces and have clearly defined objectives. As we have six members two of us tested the missions before those whom had not seen the missions prior to them being played took control of the forces. Following on from the previous missions we now come to the battlefleet gothic portion of the campaigns first phase. You can find a play-by-play of this mission in my post about revisiting battle fleet gothic here. Note that one ship had been upgraded with thunderhawks. It was the first to die. Using a point of stockpile and because the chaos value was 3 all imperial ships in the garrison fleet suffered a -1 penalty to their leadership values to minimum of 6. The warp rippled as the chaos fleet transitioned into realspace. Early warning stations were silenced as the chaos fleet flexed its might and unleashed its weaponry. Firing up their engines the fleet started to move in system. The bridge of the Emperors Vengeance erupted into action. Admiral Horst glared at the control readout. Twelve vessels had been picked out by the long ranges sensors far more than the four that had been projected by the astropathic readings. The support fleet was moving from further in system but would miss the opening salvo. Sighing he gave the order to advance while his com team fed firing solutions to the macro canon site on the surface. 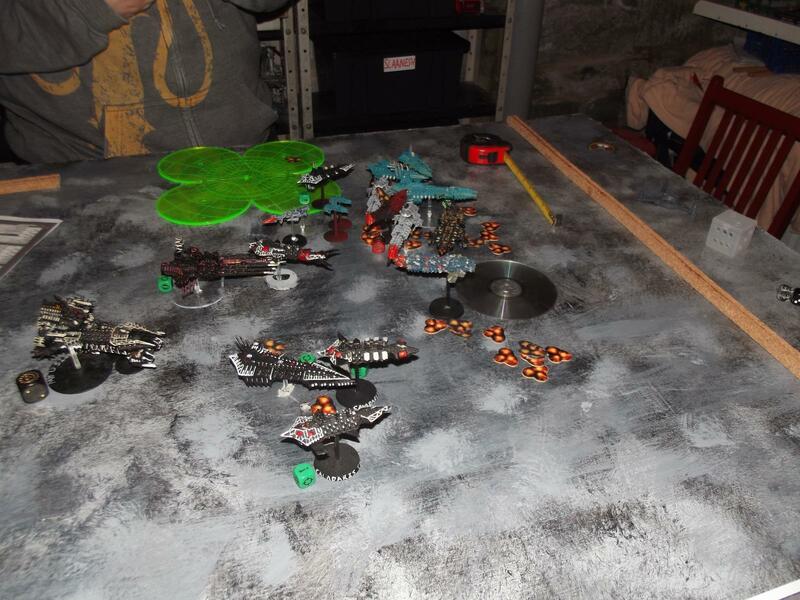 The end of the defensive forces and the breath of the chaos fleet’s survivors at the end of the BFG game. The outcome of this mission and the missions before gave the forces of chaos +15 landing force strength for the planetstrike mission that followed. While all that remained of the imperial stockpile was 3. So, moving on we had a near unwinnable planetstrike mission for the defenders. (the planet killer in orbit granted the chaos player 3+D3 orbital bombardments.) In this mission, no Alpha legion forces could be used. The imperial player spent the rest of his stockpile getting a paragon of metal thanatar, a magos prime and a unit of secutarri. 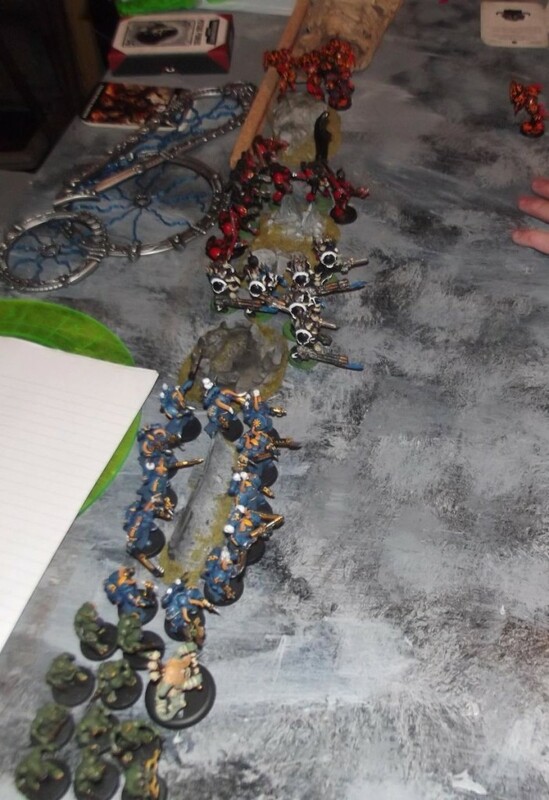 The chaos player used half of his landing force strength on additional units while the other half was reserved for generating reinforcements. 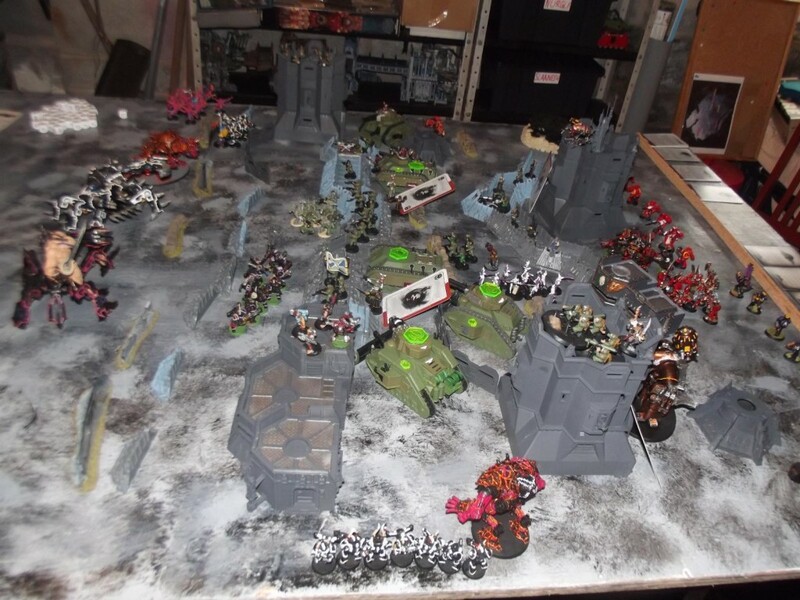 Each force started with a 2000pts list which was then expanded upon. Company command squad, commander bolt pistol, ccw, carapace armour, medipack, vox, lascannon team, master of ordinance, officer of the fleet, astropath. Infantry platoon, command squad, vox, officer with bolt pistol and ccw. Infantry squad, lascannon, flamer, vox. Infantry Platoon, Command squad, vox. Heavy weapon team, 3 mortars. Special weapons team, 3 grenade launchers. Leman russ exterminator, hull heavy bolter. Arch magos prime, mrymidax, master crafted phased plasma fusil, graviton gun, machinator array, paragon blade, chainfist, djiin skin, cyber familiar. Thanatar, hellix plasma mortar, twin linked mauler bolt cannon, paragon of metal, enhanced targeting array. Magos Driel walked calmly into the defence area. His hulking thanatar and his attendant secutarri following closely behind. Galrauch contemplated the planetary geometry and the scan results provided by the Regalia of sin. He highlighted the four viable landing sites for a full-scale invasion. One glowed a deep red showing the defensive fortress present at that location. The other three were then inspected. One had a pict capture of an ordinatus minoris engine and the other had heavy aerial activity. The final site was more sparsely defended but was further from the main objectives. Bringing up the fleet disposition Galrauch planned the attack pattern. Leading the group the Nova would bombard the area before the long-range teleportation equipment would be used to deliver the first wave. The second wave would come from further back in the fleet if the first was successful in forcing a breach. 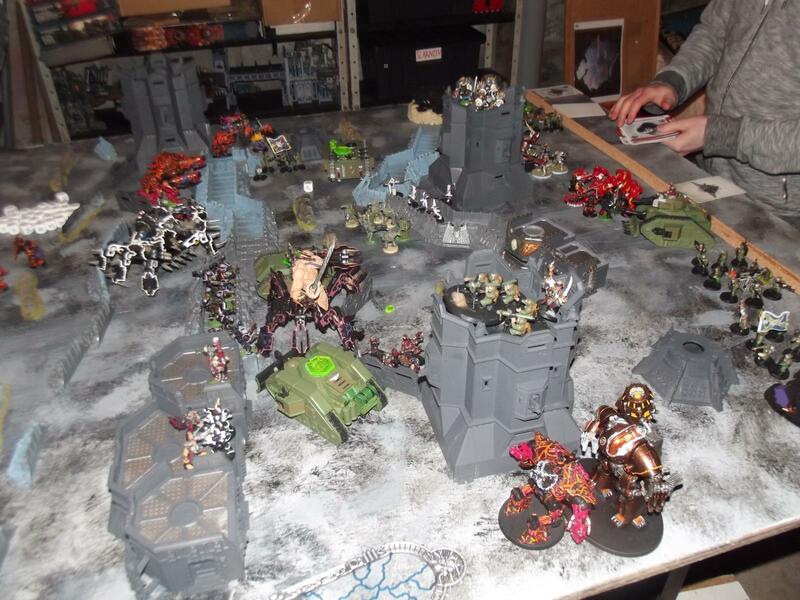 Heldrakes and daemon engines prepared for this type of mission were added to the first wave. The second wave would be spearheaded by the reaver titan epsilon which would be used to clear the site of any lingering resistance. Magos Driel tapped into the information grid that existed between the bastions and the cadian’s vox net. And used it to feel the area. The orbital bombardment was sudden and fierce smashing haphazardly along the imperial defensive line smashing into vehicles and throwing men into the air. 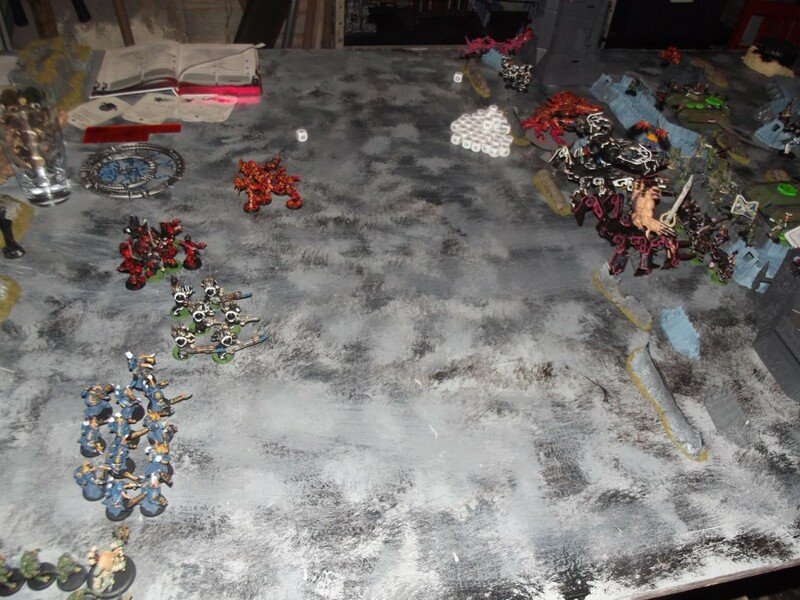 Almost immediately after while the imperial forces were still recovering the chaos forces materialised amidst the defenders and started their attack. The imperial battleline deployed and ready for the chaos attack. After the orbital bombardment had been conducted. Misplaced forces from the drop. These misplaced guys are unable to make the distance before the game ends. End of chaos turn 1, the leman russ exterminator, storm hawk squad and blood angels are awaiting redeployment. 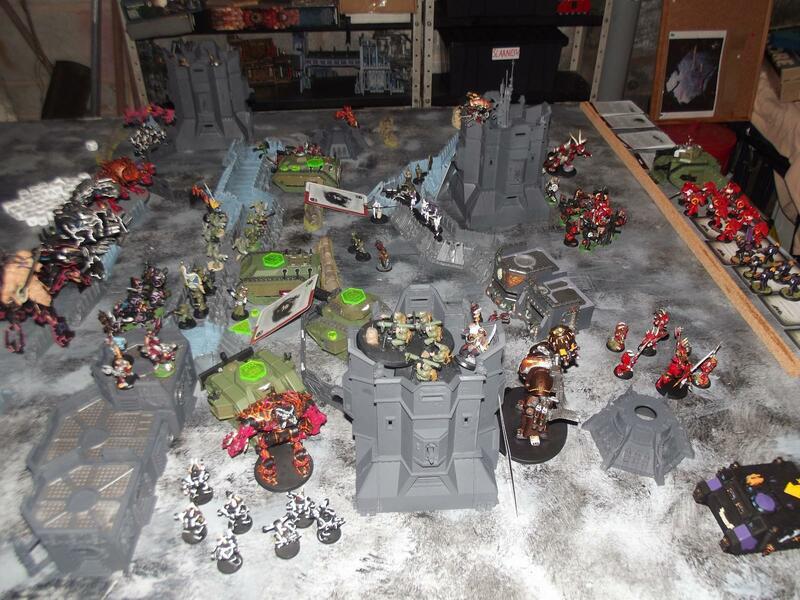 Things are looking grim for the imperium as the chaos forces continue to tear through their lines. The grey knights charge Oorlog and the blood angels charge the khorne berserkers as the thanatar charges into the decimator. 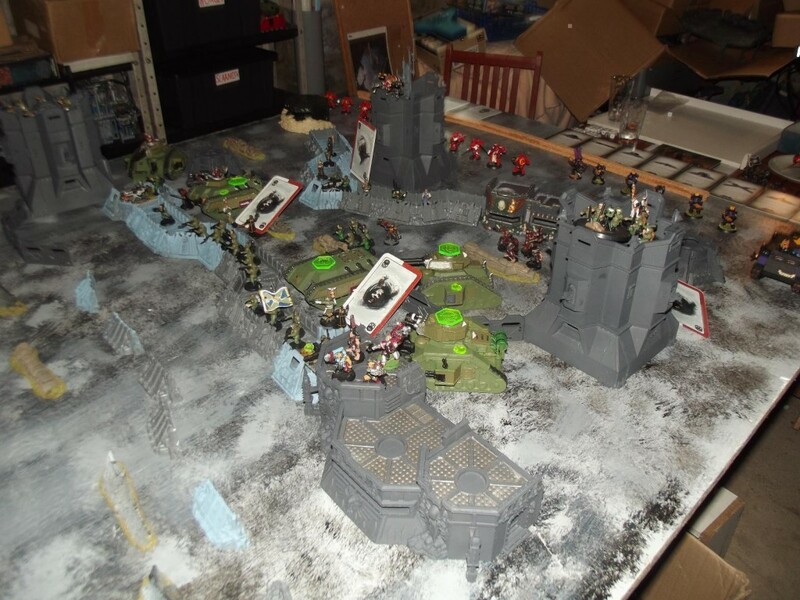 The imperial guard platoon having killed the khorne bloodletters and their herald watching on. The sensors were showing just how grim the situation was but Driel did not need them to be able to see the approaching chaos forces. Massive walking creations that had been conceived in the warp cut a swathe through the imperial defenders. While brave the space marines present were being pushed back. Flames licked out from the bastion he now stood on culling his secutarri bodyguard. Turning round he opened fire on the terminators advancing on him taking one down before they swarmed him. Sensing that the death of the vessel was imminent Driel sent his consciousness into the network he had created. It sought out and found his Thanatar. His mind took control of the automata disconnecting its intelligence for now. Driel smashed the enemies’ decimator daemon engine into the nearest bastion’s wall before he trigged the pull-back signal. Burning vehicles and the dead were left as those with longer range weapons covered the retreat. Grudgingly the remaining forces pulled back. Fire from the Warhound duo Driel had signalled stopped the main chaos advance. Smoke and dirt still hung in the air as a trio of heldrakes circled and attacked one of the warhound titans doing little more than overloading its void shields. 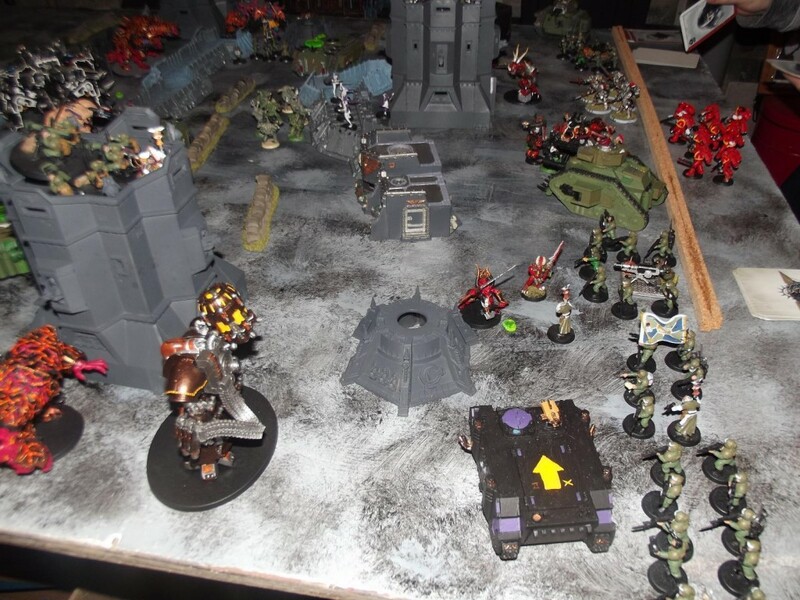 The smoke cleared as a massive energy discharge slammed into the warhound that had suffered the attentions of the heldrakes, tearing its Vulcan mega bolter from its frame and removing a few layers of armour from the machines chin. Trailing cabling as its torn armour and ruined weapon crashed into the ground. The Second warhound fired into the smoke as a chaos reaver titan strode forwards. Its gatling cannon now repeatedly striking the already damaged warhound tearing armour and machinery free as the chaos titan sought to cause as much suffering as it could. Driel repeated the pull-back order and reluctantly the still mobile Warhound pulled back. The chaos titan reached the now crippled imperial warhound and rammed its laser blaster into the slot between the inferno cannon and the titans carapace and fired. As such close range and with no void shields the warhound’s upper torso exploded outwards but it did not fall. In the head which now hung limp the princeps looked up and through his human eyes saw death as the gatling blaster spooled up and fired point blank into his titans head. What little remained of the imperial titan crashed to the ground and in victory the chaos titan roared with its inhuman voice. Driel observed the remaining forces. There were perhaps thirty guardsmen left with a single leman russ. Six blood angels all of whom had minor wounds, four grey knight terminators and a storm hawk rhino which was again being used to ferry imperial guardsmen around. He still had direct control of the Thanatar as the Warhound titan that had survived caught up with the convoy and started to provide what support it could. The second defensive line needed to hold. He sent a pulse into his personal land factory and it started to prepare another vessel for him to inhabit. There we have the report on the final part of the first phase of the narrative campaign. 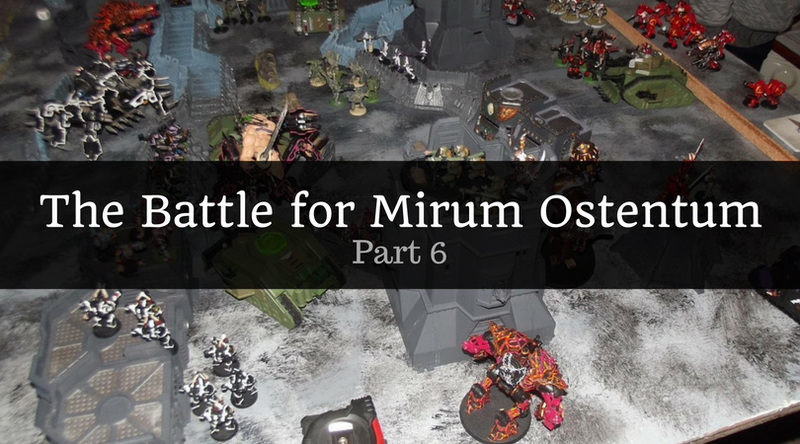 We are now on the chaos path for phase 2 can the forces of the imperium hold back the legions of chaos or will Mirum Ostentum fall? Before posting any Phase 2 reports I shall explain how the forces are assembled which missions are being played and any special rules and unique mission objectives that are being used. That was a damn big game. No surprise it didn’t reach a natural conclusion, though it’s too bad. Having to cut games short always bugs me. Good stuff and a suitable send off for that phase. Phase 2 in 8th edition? 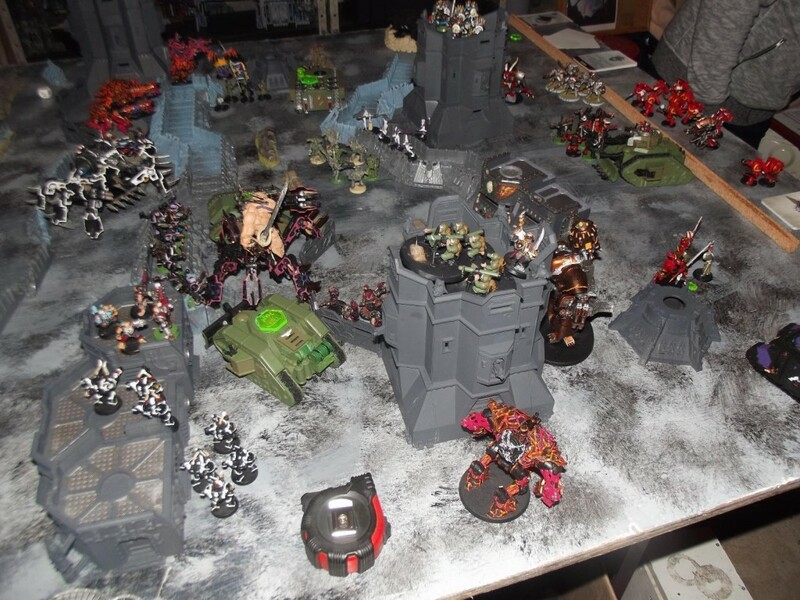 Hi Rory, Phase 2 and onwards are still being done with 7th edition as 8th has just come out and we wanted to finish the campaign with a massive apocalypse game to give 7th a suitable send off. 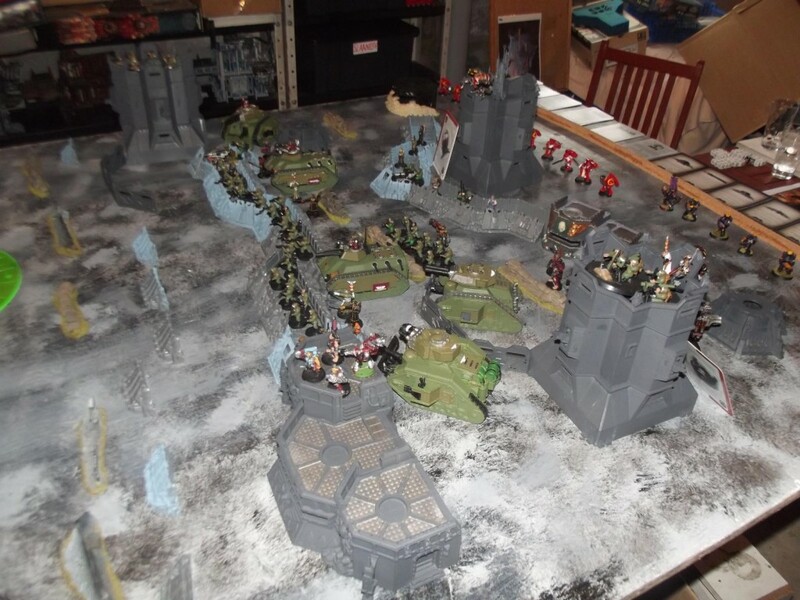 (That and a couple of players are using 30k armies which are not compatible with 8th yet [we plan to just substitute these for marines/CSM when we do play 8th though]). We do have 46,000+ pts worth of models for both imperial and chaos, so we wanted to give these a last hurrah before we drop the points down to play some games with the 8th edition rules.